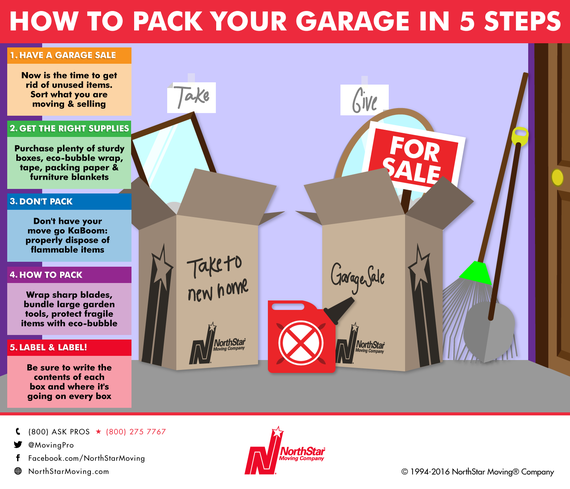 When it comes to packing up your home for a move, the garage is often the last room packed. Let's face it, we put it off due to the sheer number of things piled up and the items in the garage are the most awkward things to pack. Garages are full of tools, landscaping equipment and things you don't want to look at. Often, our garages have become the dumping ground of junk we don't want in the house. But...there are so many advantages to making the garage the first room packed. With a little planning, packing up your garage will ease your mind and possibly fill your wallet! So, how do you tackle packing a garage? 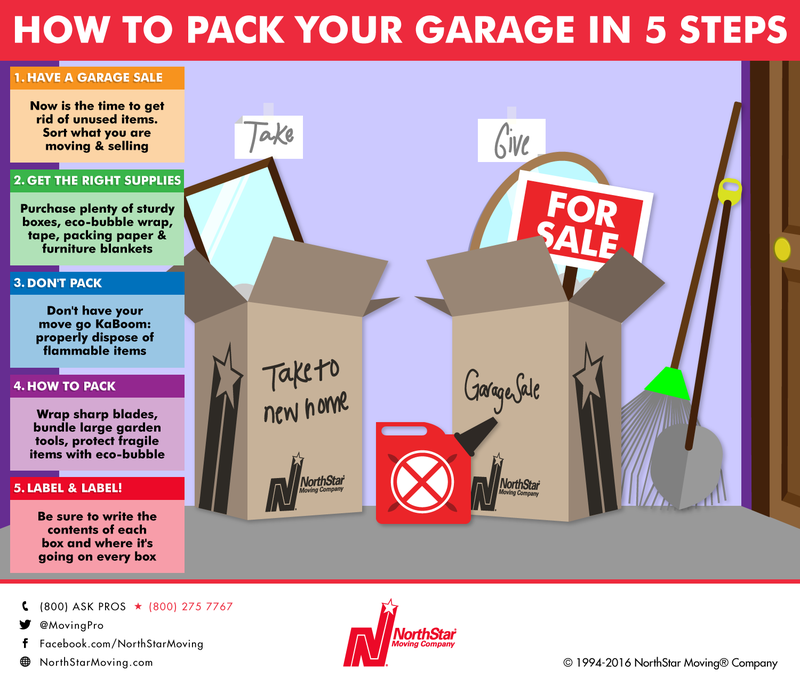 #1: Sort and have a garage sale! Moving is the time when the garage finally gets cleaned out. Hurray! It doesn't make much sense to move belongings you really have no intention of ever using at the new place. Now is the time to get rid of what you really don't need: the stroller for your now 10 year-old; the growing collection of sport teams t-shirts; tools never used; etc. But, don't just toss them out. Sell them or donate them. If you have the time, a garage sale is a great way to de-clutter and get some extra cash in your pocket. First, sort items by creating two sections in your garage: one section for the things you are taking with you and one for the stuff you don't want or need anymore. Then price and tag the unwanted items for your garage sale. The items that don't sell can be donated. Donate clothing and household items to your local favorite charity such as Goodwill for someone else to enjoy. You can even donate your unwanted furniture to the Habitat for Humanity Restore. Getting rid of items will cut down on your moving expenses and keep your new garage space nice and a great place to get the rest of your house organized! • Boxes: Sturdy, recyclable cardboard boxes of various sizes. • Eco-bubble wrap: Use biodegradable eco-bubble wrap to protect items. • Packing Tape: Every box needs to be taped, top and bottom, with 2 - 2 1/2 inch gummed or masking tape to give it additional strength and prevent opening, so you'll need approximately one roll of tape for every 15 to 20 boxes. Run multiple strips of tape along the bottom of the box in both directions to make sure the box stays secure. • Packing Paper: While ordinary newspaper works fine for some purposes, be aware that the paper's print will run giving you an extra cleaning task at your new home. • Blankets: Your mover can provide you with moving blankets for large items. Most garages have hazardous materials that can't be moved due to safety reasons. Common sense and the law forbids moving companies from moving flammable items such as aerosol cans, paints, gasoline, paint and paint thinners, charcoal, propane tanks, fertilizers, pesticides, chemicals, cleaning supplies, etc. Be sure to properly dispose of these items before your move. • Leave smaller hand tools such as screwdrivers, wrenches, pliers, hammers, etc. in your toolbox and close securely. • Wrap any items with sharp blades with a few layers of eco-bubble. • Bundle large garden tools such shovels and rakes together with tape or rope and wrap them with a large moving blanket. • Preferably pack power tools in their original container. Remove any detachable parts a tool may have, including the batteries, and pack them in the same box. • Gas operated machinery such as lawn mowers and chain saws must be emptied of their fuel before they are moved. • Stack outdoor chairs and disassemble other outdoor furniture when possible. Remove cushions and pack them in boxes. • Wrap fragile flowerpots in eco-bubble. However, keep in mind moving companies cannot move plants across state lines. And your plants won't survive in storage. • Clean, defrost and dry: refrigerators and freezers. Wrap them with moving blankets for protection. • Dissemble bikes as much as you can before the movers get there, remove the handlebars and wheels. If you can, it is best to go to a local bike store and look for an original bike box and use it to pack the bike. • If a grill is equipped with a propane tank it cannot be moved even if it is empty. And, you cannot move charcoal either. Best to give them away to neighbors. Remove the entire propane tank and the charcoal before you move just the grill. Remember that memory card game? It's hard to find those two matching elephants in rows and rows of cards. Label each box with what contents are on the inside and write the location where this box is going: "Habitat for Humanity Restore" or "GARAGE" and remember to write "FRAGILE" when needed. While the garage is often the last room packed in a home, make it your first. It takes a lot of time; from sorting, dealing with odd shaped tricky items to packing and donating. So start early and ask for help! You can also use that empty garage space for moving items out of each room and sorting. Repeat the above steps for each room. Wishing you a stress free move!